Tarot of the Magicians by Swiss occultist artist and author Oswald Wirth was first published in Paris in 1927, and a Weiser edition was later released in 1985. The Weiser edition is a direct translation and the first and only English-language edition of this important work. Long unavailable, the book is back in print in a beautiful new package with full-color pull-out cards reproducing Wirth's 1889 tarot deck. 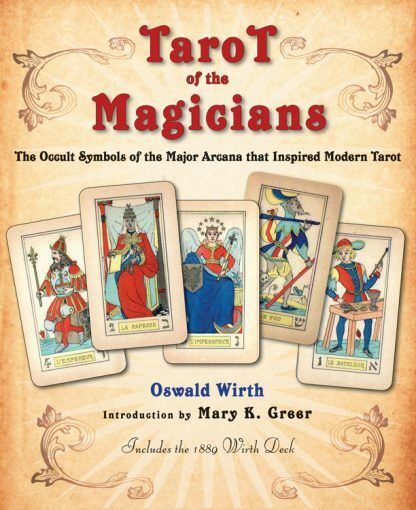 With a new introduction by bestselling tarot author Mary K. Greer, Tarot of the Magicians offers tarot enthusiasts and students of the occult an in-depth and authoritative analysis of one of the most beautiful and evocative of all modern tarot decks. In this important tarot work of the Major Arcana, Wirth combines the imagery. Oswald Wirth (1860-1943) was a Swiss occultist, artist and author. He was a student of Eliphas Levi and was mentored by Stanislas de Guaita.